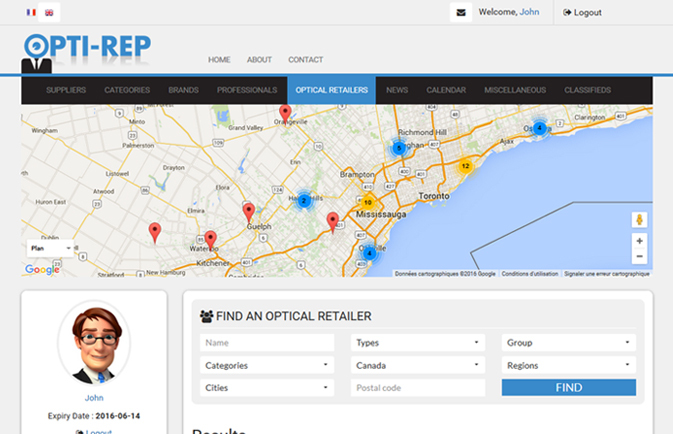 Opti-Rep is a platform especially created for sales departments and sales representatives in the Canadian optical industry. It gives you the practical and useful information you need to better prospect new optical stores and extend your clientele. With Opti-Rep you can easily and rapidly find retailers and eyecare professionals’ coordinates and profiles and benefit from a complete solution that will maximise your efforts. Manage your follow ups, obtain key stats, plus find the latest news and events in only a few clicks. Coordinate your sales team with the help of an administrator’s account offered at no charge when opening two or more sales representatives’ accounts. Follow their actions and guide them in order to simplify and improve your working relations. Now is the time to discover the most complete sales tool in the optical industry, covering Canada from coast to coast. Dont have account ? Signup !